Voltress began as a pop duo performing 80’s inspired electropop, but after their first release, they turned in a more avant-garde direction, incorporating free jazz, experimental sound collage and motorik style rhythms into lengthy pieces. The first release exploring this new direction was 2007’s Antelopes, featuring a bevy of famous guest players. Moth is their latest release. As with Antelopes, it’s issued on vinyl, with a CD version included, and features one lengthy track per side, although this time each track is divided into smaller cuts, but they all flow one into the next. 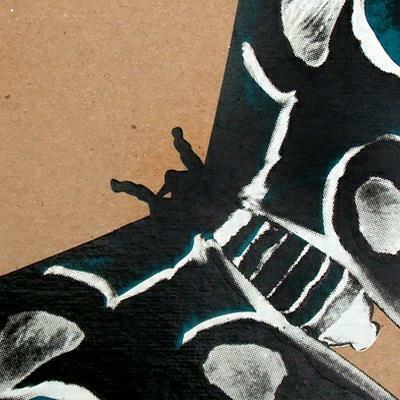 Again we have the Krautrock style rhythms tying together a jazzy panorama of sounds, but Moth is a decidedly cooler, almost more gothic affair than Antelopes. The warm, funky organ from that release has been traded in for a more classical sounding acoustic piano that dominates much of the sonic landscape on Moth with sharp stabs and a more formal playing style. Some of these words may sound like criticism, but they are meant to show the contrast of how the band has evolved. Still retaining the same style, they explore it with new dimensions. Although those piano chord stabs do get occasionally a little repetitive! Joining Voltress again is veteran sax man Roscoe Mitchell (Art Ensemble of Chicago), bringing his trademark free jazz approach which plays off the more rigid sound of the piano in curious ways, like light and shadow, contrasting, creating intriguing shades of sound. Also joining in on these sessions are guitarist Nels Cline (Wilco) and jazz bassist Harrison Bankhead (8 Bold Souls). There are less voice samples this time, the band focussing more on the music and the swirling, dark organic backdrops to the craziness going on in the foreground. The motorik beats also give way sometimes to more free drumming, giving this whole album a decidedly jazzier feel, and less of a rock feel than Antelopes. It’s an interesting work they have done here, but sometimes feels a little too detached, too cold to really get into. But perhaps that was the point. Nonetheless, it is a worthy successor to Antelopes, as Voltress bravely forages onward in new directions, searching for new sonic territories to discover.